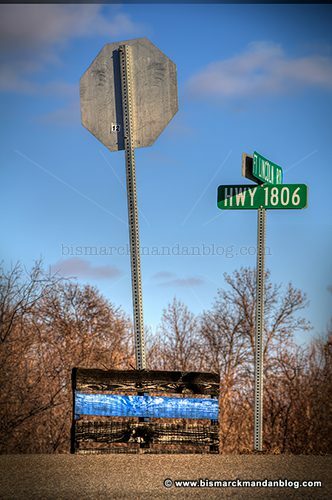 For the past few months, Highway 1806 has pulled different duty than usual. If you don’t live south of Mandan or have things to do at Huff Hills or Fort Lincoln, you probably haven’t been down this road in a long time. Oh, unless you’re in law enforcement, that is. This pallet is a nice way for someone to Back the Blue on that road, as plenty of law enforcement would go by over the period of several months. I’ve seen a lot of things done with pallets, but this one has got to be my favorite! I’m all for showing our community’s appreciation for our law enforcement heroes. This entry was posted in Around Bismarck-Mandan, Cool by Clint. Bookmark the permalink.